KUNA, Idaho – If Wednesday’s second round was any indication of what’s to come, then the final round of the 2018 Idaho Junior Amateur is sure to come down to the wire. Meridian’s Jack Curran remained atop the Boys 16-18 division leaderboard, but a few new faces joined him there. Brayden Ogle (Hayden) and Nick Roberts (Meridian) had solid rounds of 70 and 72 respectively to join Curran at +2 for the tournament. Four others are within 5 shots. The Girls division didn’t quite have the same parody as the boys. Eagle’s Carly Carter posted an even par 72 to remain the sole leader at -1 overall. Carter continued to drive the ball with accuracy, setting herself up for great birdie opportunities. Girls Jr. America’s Cup teammates Christine Cho and Makena Rauch will join Carter in the final pairing. Cho is +4 overall while Rauch is +9 overall. The round of the day belonged to Taylor Mortensen of Meridian. He piled up nine birdies on the day en route to a 6-under 66. He leads the Boys 13-15 division by 7 strokes at -8 overall. The shot of the day went to Cole Jaworski. On the 8th hole at Falcon Crest, Cole struck a shot with 9-iron from 156 yards out that took a couple short hops before spinning right into the cup for a hole-in-one! The 9-hole players wrapped up their Junior Amateur experience on Wednesday. The Diamond Line Player of the Year Awards were announced as well. Points accrued from Idaho Junior Tour events throughout the course of the season decided who would take home the trophies. KUNA, Idaho – Usually as August rolls around the focus of kids around the country turns to the impending school year, but on Tuesday at Falcon Crest Golf Course the focus was narrowed on the first round of the 2018 Idaho Junior Amateur sponsored by Diamond Line Delivery. The round of the day belonged to Garrett Packebush of Liberty Lake, Wa. His 6-under 66 including 6 birdies and an eagle placed him 4 shots clear of second place in the Boys 13-15 division. The Boys 16-18 division featured a tie for first between two Treasure Valley players. Meridian’s Tristan Belue and Jack Curran both shot an even par 72 on a long, difficult setup. Carly Carter, fresh off an appearance at the Girls’ Jr. America’s Cup, topped the leaderboard of the Girls 13-15 division with a 1-under 71. The Girls 16-18 division is led by another Girls Jr. America’s Cup Team Idaho member – Makena Rauch with a 74 (+2). The 9-hole players (ages 9-12) made a statement, too. Tyce Helmick and Reid Piron have been stalwarts in Boise area Junior Tour competition and continued playing well in the pressure packed season finale. Both boys shot 34 (-2) to lead the Boys 11-12 division. Tuesday night was capped with games hosted by Joe Malay and a dinner for all players and their families. Players age 9-18 qualified through Idaho Junior Tour District Tournaments, Top 1000 AJGA or Junior Golf Scoreboard rankings, or District Player of the Year Exemptions. Winners of the Boys & Girls 16-18 divisions claim the Joe Marmo Cup (Boys) or Jackie Gasser Cup (Girls). The PGA Rocky Mountain Section retained the Carter Cup with a late comeback over the IGA Amateur team at RedHawk GC in the 2018 edition of the event. The PGA Pros won with 30 1/2 points to the IGA’s 29 1/2. The Carter Cup is a Ryder Cup style event held every 2 years featuring alternate shot, four-ball, and singles matches. The week of July 23, 2018 was a busy one for some of Idaho’s top golfers. Teams representing Idaho competed against the top talent in the country (and worldwide). The Pacific Coast Amateur Championship is one of the oldest and most prestigious amateur golf championships in North America. The Morse Cup is a team competition held concurrently with the Pacific Coast Amateur, held July 24-27 at The Olympic Club in San Francisco. 15 member associations comprise the Pacific Coast Golf Association, including 13 from the United States and two from Canada. SAN FRANCISCO – The Idaho Golf Association has selected Carson Barry (Meridian, ID), Derek Bayley (Rathdrum, ID), and Josh Gliege (Eagle, ID) to represent the IGA for the Morse Cup. The Morse Cup is a team competition held concurrently with the Pacific Coast Amateur, held July 24-27 at The Olympic Club in San Francisco. The Morse Cup is held the first two days of competition – 36 holes of individual stroke play. The Southern California Golf Association is the defending champion. Carson Barry is a recent graduate of Rocky Mountain HS who will play for Oregon State University this fall. He won the 2016 and 2018 5A High School State title and was the runner-up at the 2017 Idaho State Amateur. He represented Idaho at four Hogan Cups and three Junior America’s Cups. In 2018, Barry posted four AJGA top 10’s and was ranked 32nd in the final AJGA rankings. Recently Barry competed of the 2018 U.S. Amateur Four Ball with partner Sam Tidd. The pair made it all the way to the semifinals at Jupiter Hills Club in Tequesta, FL. Derek Bayley is a recent graduate of Washington State University where he started all four years for the Cougars. He was a member and team captain of Team Idaho at the 2013 Junior America’s Cup and 2013 Hogan Cup. He won the 2016 Idaho State Amateur. Two-time winner of the Idaho State Match Play Championship (2017, 2018). Two-time runner-up at the PNGA Men’s Amateur. This summer Bayley qualified for the 2018 U.S. Amateur and won the Rosauers Open Invitational in Spokane, WA. The Rosauers is a Pacific Northwest PGA Section major – Bayley won the event in 2016, as well. Josh Gliege is a soon-to-be junior at Texas A&M. As a sophomore, he notched three top-5 finishes for the Aggies. He won the 2015 5A High School State title as a senior at Eagle HS. The Pacific Coast Amateur Championship is one of the oldest and most prestigious amateur golf championships in North America. The first tournament was held on the links of San Francisco Golf Club at The Presidio in 1901. After being played until 1911, The Pacific Coast Amateur then ceased to exist, only to be reconstituted at Seattle Golf Club in 1967. Held on an annual basis since 1967, the Pacific Coast Amateur Championship boasts a rich history of showcasing some of the most talented golfers in the United States and Canada. BOISE, Idaho – Haley Nist began the final round of the 2018 Idaho Women’s State Amateur with a 3 shot lead, and after an up-and-down final 18 holes at Shadow Valley she walked away the champion. Nist, soon to be a senior at The University of Colorado-Boulder, did not make any birdies in the second round. She improved on that statistic right out of the gates on Saturday. Birdies on two of the first three holes boosted the lead and alleviated some of the pressure on Nist. Nist struck the ball with consistency and backed it up with excellent putting on the front nine. Nist hit every fairway, but her iron play separated her from the competition. 7 out of 9 greens in regulation led to some makeable putts, many of which Nist missed by mere centimeters. At the turn Nist looked to be well in control – the only player in the final pairing under par. The back nine was a different story. The rough back nine started with a drive landing near the base of a tree on #10. After a punch out, Nist bogeyed the hole. A similar situation on #12 led to another bogey. She was dropping shots, but fortunately for her the closest competition couldn’t apply any pressure. The competition, 14-year-old Kelli Ann Strand, was excellent off the tee, but struggled to hit greens all day. Strand showed flashes of great play, but ultimately couldn’t find any key putts to fall. She finished with a final round 76. Nist hit 4 fairways and 6 greens in regulation on the back, but brilliant short range putting kept her lead safe. With a six shot lead heading into the 16th hole, Nist had control over her own destiny. On the 18th with a four shot lead, Nist calmly hit both fairway and green, and 2-putted for victory. A fitting representation of the steady play that showed up from Nist all week. She finished the tournament 75-74-75 224 (+8), 4 strokes ahead of Strand. The Idaho Women’s State Amateur has been contested since 1934. BOISE, Idaho – Shadow Valley Golf Course got the best of most of the field in the second round of the Idaho Women’s Amateur. Tricky hole locations and stronger winds led to a higher scoring average on Friday. Haley Nist of Meridian, ID shot the low round of the day, a 2-over 74, to take the lead heading into the final round. Consistency was the key to Nist’s second round. 16 pars and 2 bogeys provided little excitement to the round, but it was enough to get the job done on moving day. Nist says she’d like to make more birdies in the final round, but is content with playing consistent and shying away from big mistakes. Nist is no stranger to understanding what it takes to win the Women’s Amateur; she won the event in 2014. Nist will be a senior playing for the University of Colorado, Boulder in the fall after transferring from Oregon State. Tied with Nist for low round of the day was Allison Olberding of Des Moines, Iowa. Olberding plays for the College of William & Mary in Virginia and is currently a USGA PJ Boatwright intern with the Idaho Golf Association. Idaho Junior Tour players and parents may recognize her from her assistance with the program. Olberding and Kris Fenwick of Boise are 9 shots behind the leader. Round 1 leader Kelli Ann Strand stumbled in her second round, shooting 80, but lands in the final pairing with Nist and Olberding 3 shots back of the lead. 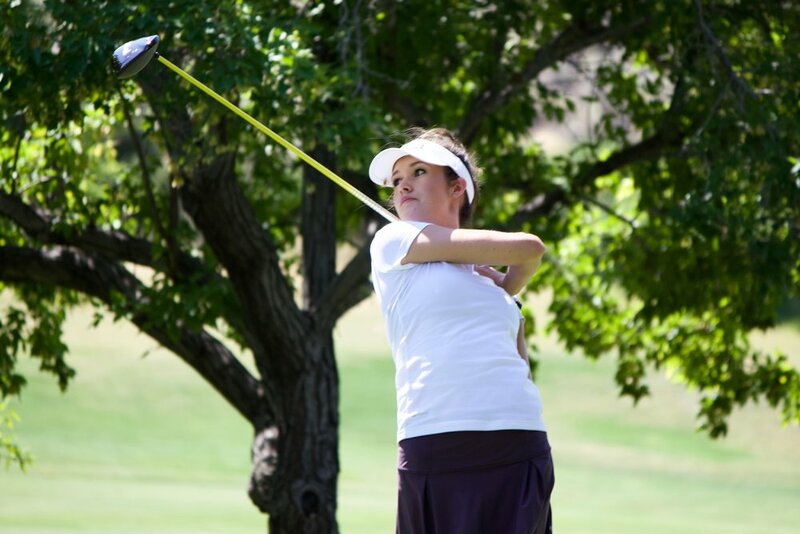 BOISE, Idaho – Kelli Ann Strand is set to take the golf world by storm. The 14-year-old from Challis, Idaho has already qualified for two national junior golf tournaments this summer. An Idaho State Amateur trophy may be next on her list of accolades, and she isn’t even a high school freshman yet. Strand shot an even par 72 in Thursday’s first round and leads by 3 strokes at Shadow Valley Golf Course. Strand recorded 3 birdies and no bogeys on the front nine for a 3-under 33. On the back, she showed no signs of slowing down with an eagle on the par-5 13th hole, but then a triple bogey on 15 slowed the momentum. Still, Strand is proving that she belongs at the top of the leaderboard even as the youngest player in the field heading into the second round. Oregon State golfer Haley Nist and former Idaho Women’s State Amateur champion (2014) is in a tie for 2nd after posting a 75 (+3). Tied with Nist is the 2018 State Match Play champion Kris Fenwick of Boise. Pullman, Wash. – Derek Bayley of Rathdrum, Idaho shot rounds of 64-74 to earn medalist honors in leading the field of 50 players who competed today in 36-hole U.S. Amateur Sectional qualifying at the par-72 Palouse Ridge Golf Club in Pullman, Wash. Along with Bayley, the other player to advance from this qualifier is Chris Hatch of Mukilteo, Wash., who shot rounds of 70-69. Bayley and Hatch now advance to the 2018 U.S. Amateur Championship, which will be held August 13-19 at Pebble Beach (Calif.) Golf Links. Bayley blistered the morning round in today’s qualifier, firing 11 birdies and making only four pars on his way to an 8-under 64. Bayley continues his summer of quality golf. Last week he won the Rosauers Open Invitational in Spokane, Wash., competing against the region’s PGA professionals. This is the second time he has won the Rosauers, which is one of the Pacific Northwest Section PGA’s majors, having previously won it in 2016. Earlier this month he made it to the Round of 32 of the PNGA Men’s Amateur. Last fall Bayley was named the 2017 WSGA Men’s Player of the Year, after finishing second in the Washington State Men’s Amateur and runner-up in the PNGA Men’s Amateur. He is a recent graduate of Washington State University, where he starred all four years on the men’s golf team. Today he competed on the school’s, and his, home course of Palouse Ridge. In today’s afternoon round, Hatch was 5-under after 12 holes, and had a 1-shot lead over Bayley, but had two bogeys coming in to finish one shot back. Hatch graduated from Western Washington University in 2017, where he played all four years on the men’s golf team, and was named a GNAC All Star all four years and First Team All-GNAC for three years. He set a GNAC record for 119 rounds played. He played in the inaugural U.S. Amateur Four-Ball Championship in 2015. Hatch also made it to the Round of 32 at the PNGA Men’s Amateur earlier this month. The two alternates from this qualifier are Brian Mogg of Issaquah, Wash. (first) and Grant Cole of Pullman, Wash. (second). The Washington State Golf Association (WSGA) is the local representative of the United States Golf Association (USGA) and conducted this Sectional qualifier for the U.S. Amateur Championship. 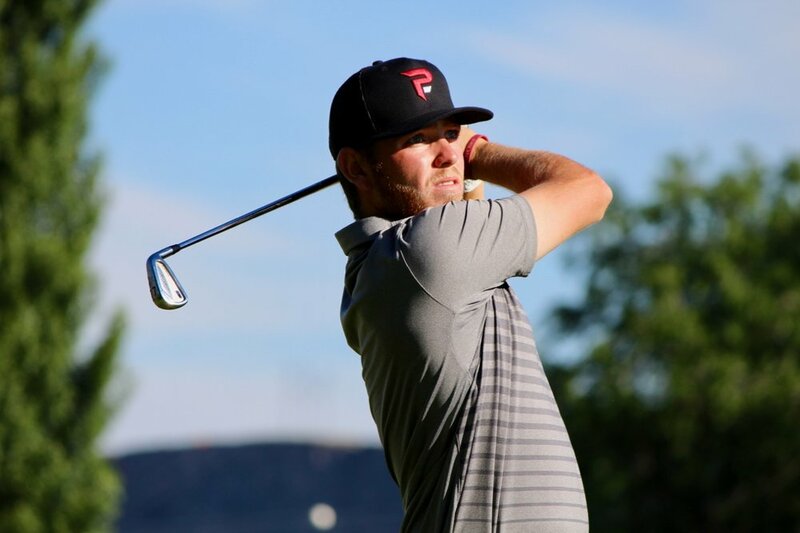 EAGLE, Idaho – On a blistering hot Monday at BanBury Golf Club Colby Dean once again found himself in contention to achieve one of amateur golf’s greatest accomplishments. Dean was 3 shots behind the leader after the first round, but a second round including two eagles and five birdies catapulted Dean into the lead. A 36-hole total of 133, 69-64 (-9) gave the 2018 State Amateur Champion the lone qualifying spot for the U.S. Amateur, held at iconic Pebble Beach this August. The first highlight of Dean’s final round occurred on hole #12. Two long irons set up a short approach shot into the par-5. His wedge shot from 105 yards out landed 10 feet behind the hole and spun back into the center of the cup for eagle. The next highlight came on the final hole of the tournament. Dean hit a crisp iron shot into the short par-5 and left himself with a 10-foot eagle putt. He would go on to sink that putt and celebrated with a fist pump. After the round Dean said he knew making that putt would be the difference maker. In similar fashion to last month’s State Am, it was Hunter Ostrom and Dean battling for first place, although the two were not paired together for this qualifier. Notre Dame’s Ostrom (2 shots back after 18) and round one leader Connor Johnstone of Boise State still topped the leaderboard after 27 holes of play. The familiar foes went toe-to-toe in the pairing right behind Dean. Johnstone and Ostrom exchanged birdies throughout the final round. Two shots right next to the hole on the par-3 16th hole and subsequent birdie putts summarized the way these two rivaled each other. Ostrom’s relatively mistake free final round 66 was good enough to earn him the first alternate spot. A couple of mistakes off the tee for Johnstone set him back a little, but a solid final round 69 was good enough for third. If history is any indication, there is a good chance that Ostrom could make it into the field at the U.S. Amateur as an alternate. Dean says he’s excited to play Pebble Beach for the first time in such a prestigious tournament. He’s also looking forward to spending the week with a former college teammate from Chico State who qualified earlier this week. This year’s U.S. Amateur will be held August 13-19. Two round of stroke play will be followed by match play. Match play will be broadcast on FS1. BOISE, Idaho – Idaho’s future stars were on the course today at Crane Creek Country Club in a battle for a single spot in the U.S. Junior Amateur and the U.S. Girls Junior Amateur. Jonas Bicknese of Fruitland, Idaho shot a 2-under 70 to punch his ticket to the U.S. Junior Am held at the historic Baltrusol Golf Club in Springfield, New Jersey. “I wasn’t expecting to play well today. I played poorly in the State Am this past weekend, so I didn’t know what to expect,” Bicknese said after the round. On a difficult setup at Crane Creek, Bicknese was forced to convert many up-and-downs from off the green. He gave credit to his putting for these par saves. Spectators and Bicknese’s playing partners agreed, saying that he practically made every putt he had. The highlight of the round for Bicknese came on holes 14 and 15. A bogey on the par-5 13th dropped Bicknese to 1-under after hitting a tee shot that ended up in a hazard. Bicknese birdied the next two holes, a move that would prove crucial as the rest of the field hovered around par. The girls’ qualifier was also extremely competitive. As the heat turned up in the Boise foothills, it became apparent that no career rounds were to be shot. Whoever made the least amount of mistakes would survive and advance to the U.S. Girls’ Junior Amateur at Poppy Hills Golf Course in Pebble Beach, Calif.
Julia Garcia, all the way from Temple, Texas, shot a 1-over 73 to outlast the competition. Garcia’s bogey, bogey, bogey start was not ideal, but 4 birdies throughout the round brought her back into the fold. Pocatello’s Payton Fehringer was the first alternate and Boise’s Emily Cadwell won a playoff in three holes to become 2nd alternate. For the boys, Seattle’s Daniel Tiscareno was the first alternate and Meridian’s Jake Slocum won a playoff to become 2nd alternate. The U.S. Girls’ Junior takes place the same dates. 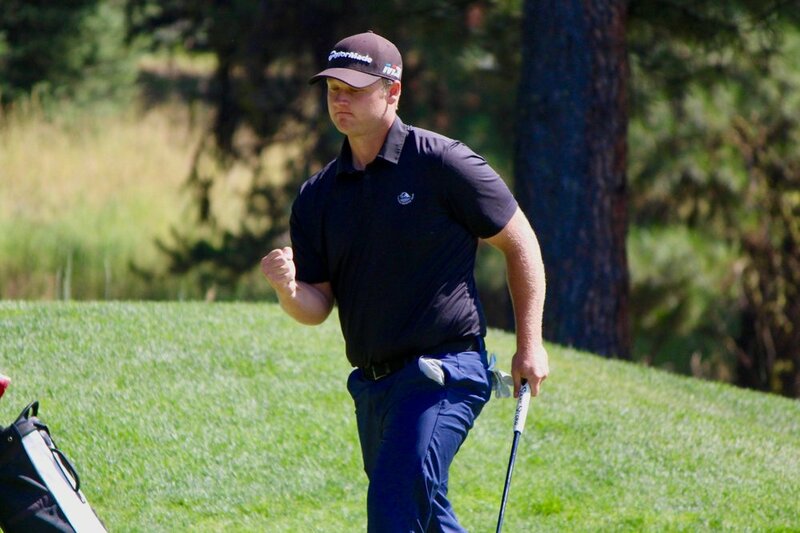 TWIN FALLS, Idaho – Not often do we see a dominating performance at the Idaho State Amateur. The event reserved for the state’s finest players was led start to finish by Eagle’s Colby Dean. Colby hoisted the trophy on Sunday afternoon after finishing with a score of 10-under at Canyon Springs Golf Course. View full Idaho State Am results here. TWIN FALLS, Idaho – Day 1 leader Colby Dean started off Saturday’s second round with a couple mishaps, but he didn’t let that affect him for the rest of the day. Dean shot a 3-under 69 to stay atop the Idaho State Amateur leaderboard. A couple of wayward tee shots on holes 13 and 14 resulted in bogeys for the Chico State grad. On 14, Dean remained focused after going O.B. left and knocked in a 15-foot putt with confidence to save bogey. Perhaps 4 years of college competition prepared Dean to bounce back from adversity. Maintaining a lead is not an easy task considering Chris Carew in 2nd place was off to a hot start in the same group. Dean finished his first nine holes with 2 birdies to climb back to 1-over on the day (-6 total). Dean fared much better on the back nine. Accurate drives set up a few birdie chances, which he capitalized on with great putting. A key highlight on the second nine being a birdie on the difficult par-3 5th hole playing straight into wind gusts of up to 25mph. Hunter Ostrom also finished the day 3-under, giving him a two day total of 139 (5-under). Ostrom once again put an eagle down on the scorecard, and made 2 fewer bogeys than Friday (3) proving that his game is trending upwards heading into Sunday. Carew finished with a 75 (+3), but remains in 5th at 1-over. Rounding out the final pairing is Jason Huff who fired a 73 (+1) which was good enough for 4th place at even par. One of the more fascinating stories of moving day was Randal Cross. The Twin Falls resident played in the first flight, but shot a lights-out round of 68 on Saturday to give him a two-day total of 140 (-4) – which, yes, is currently in third place. The 54-year-old is one year shy of senior status for IGA championships, but is showing the state why he belongs in the top 5 of the IGA’s hallmark event. Be sure to follow along with the final round and view all scores from Canyon Springs in Twin Falls here. TWIN FALLS, Idaho – The first day of the 2018 Idaho State Amateur proved to be a tough test for the state’s top players. Colby Dean of Eagle, ID leads the field with a 7-under 65. Trailing in second place are Meridian’s Hunter Ostrom and Chris Carew, who each dropped a score of 2-under 70. Jason Huff from Moscow, at 1-under, was the only other player under par at Canyon Springs Golf Course in Twin Falls. Dean, a recent graduate of Chico State University, played with impressive consistency. A bogey free round with 7 birdies puts Dean 5 strokes free of second place. “I was pretty good tee to green, and I didn’t leave myself with any stressful putts,” he said after the round. Ostrom will be a junior at Notre Dame in the fall, and is already a 2018 IGA championship winner at the Four-Ball. He went eagle, birdie, birdie on holes 14, 15, and 16 to get to 2-under. Carew, a high school teammate of Dean at Eagle High School, played his way into second place by only making 2 bogeys with 4 birdies. Huff is a former University of Idaho golfer who stayed in contention by staying away from any high numbers and balanced bogeys with birdies, much like Carew. A few of the expected leaders going into Friday’s first round played well enough to stay in contention, but they’ll need low rounds on the weekend barring a major collapse by the front of the pack. Saturday’s second round is predicted to be affected by strong wind gusts, so it might not be surprising to see results higher than the first round stroke average of 76.92. BOISE, Idaho - The Idaho Junior Tour season kicked off the 2018 season with tournaments in three districts on Wednesday. District 1 played their matches at RedHawk GC and Lakeview GC for 13-18 year-olds and 9-12 year-olds respectively. Twin Falls GC was host to District 2’s events, and District 3 hit the links of Teton Lakes GC. The future of the game in Idaho is in good hands. Junior Tour veterans showed up ready to shoot low scores, and first timers made the best of their opportunity to grow as players and young men and women. The Idaho Junior Tour is Idaho’s only premier junior golf tour, available to any Idaho golfers between the ages of 9 to 18. The Idaho Junior Tour is dedicated to providing junior golfers the opportunity of playing golf competitively while applying the rules of golf, practicing proper golf course etiquette, and encouraging and developing sportsmanlike conduct. The Idaho Junior Tour is divided into four districts: District 1 (Western Idaho), District 2 (Central Idaho), District 3 (Eastern Idaho), and District 4 (Northern Idaho).